22 © 2004 Solution Beacon, LLC. All Rights Reserved. 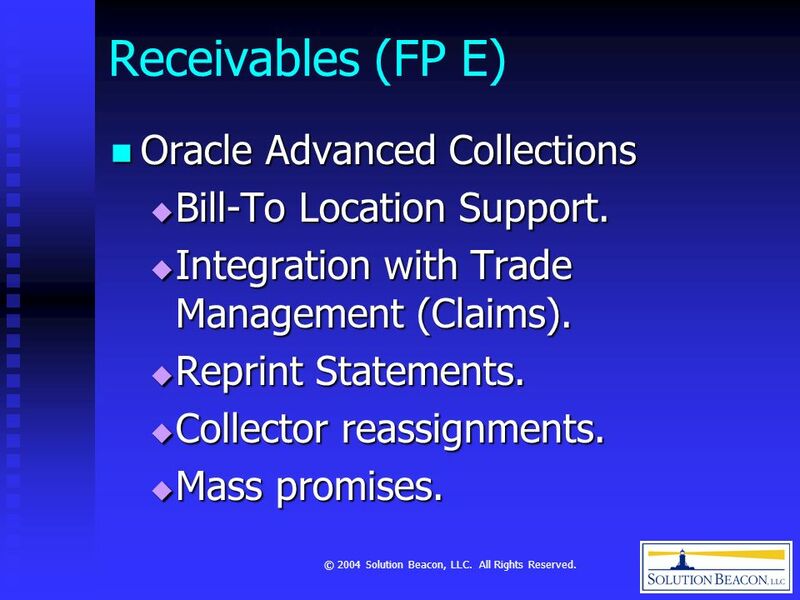 Receivables (FP E) Oracle Advanced Collections Oracle Advanced Collections Bill-To Location Support. Bill-To Location Support. 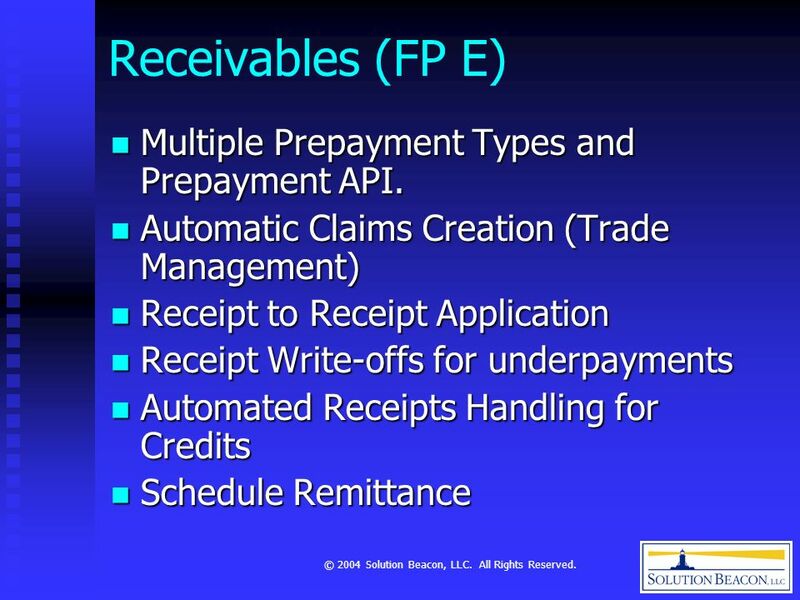 Integration with Trade Management (Claims). 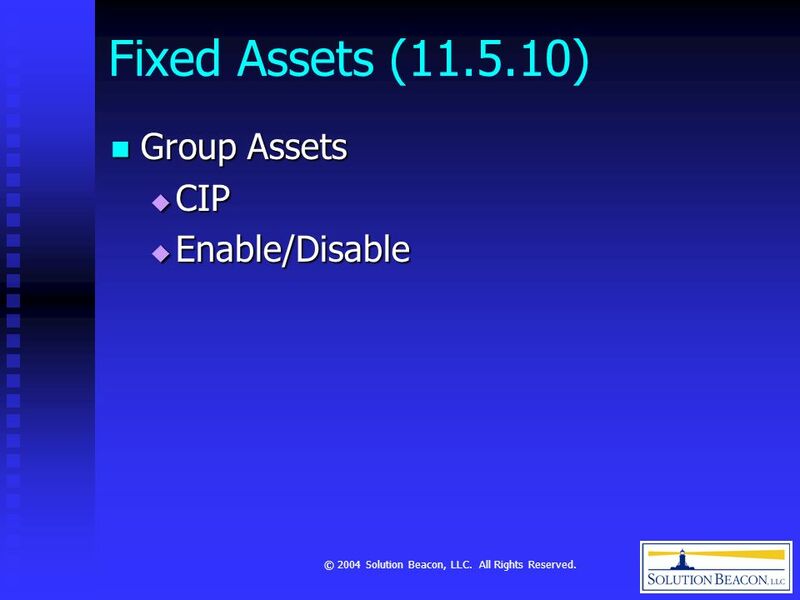 Integration with Trade Management (Claims). Reprint Statements. 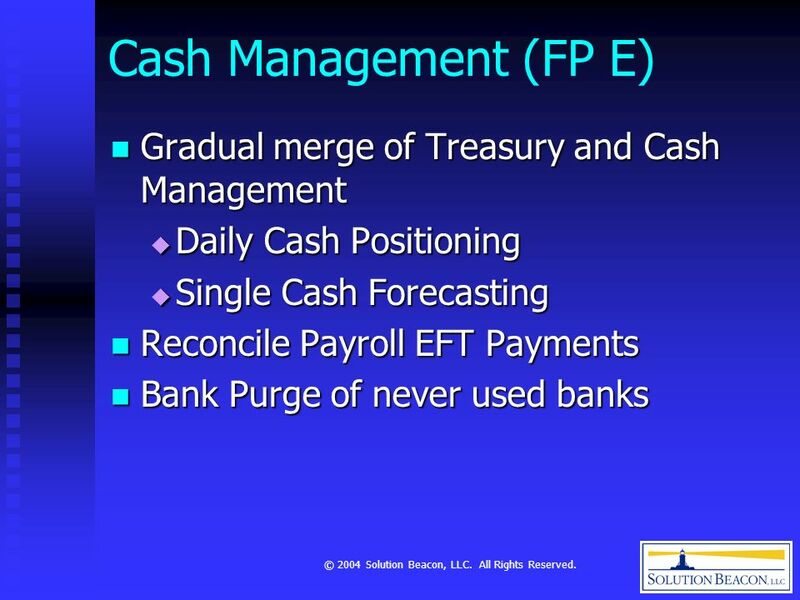 Reprint Statements. 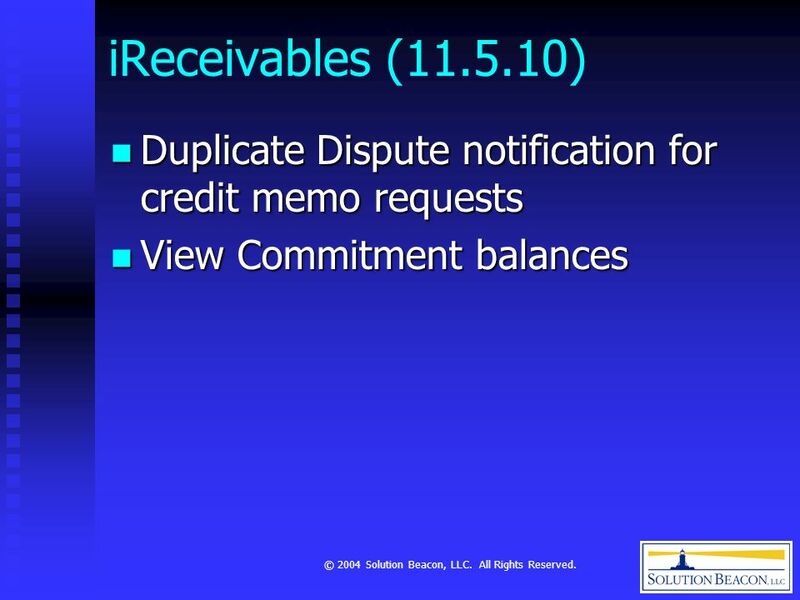 Collector reassignments. 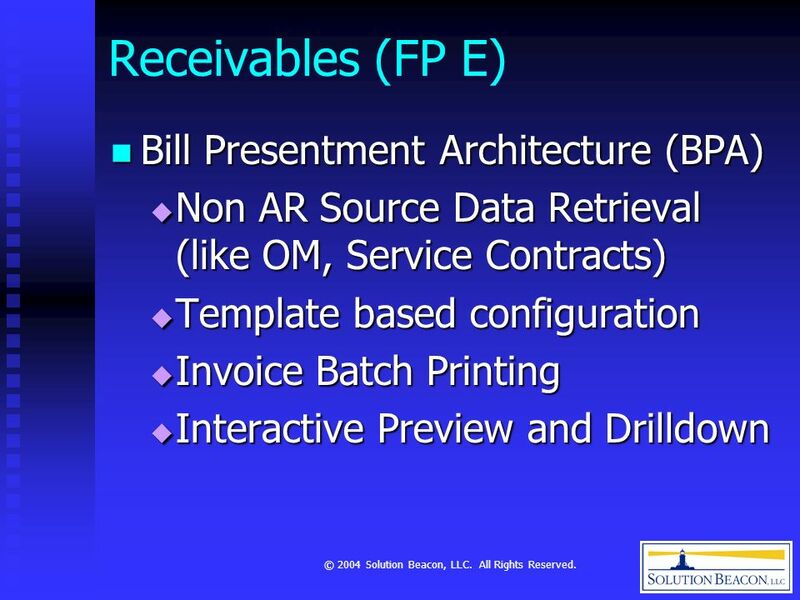 Collector reassignments. Mass promises. Mass promises. 26 © 2004 Solution Beacon, LLC. All Rights Reserved. 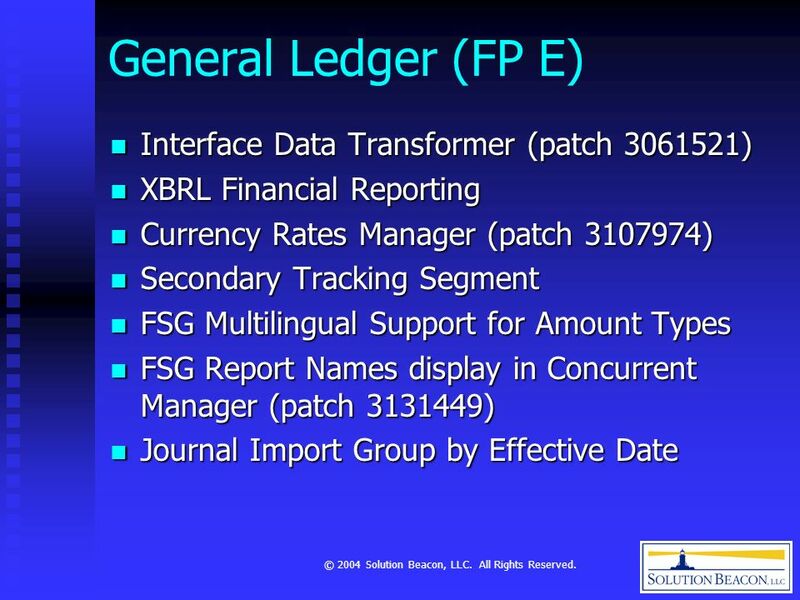 General Ledger (FP E) Option to Continue Step-Down Allocations Option to Continue Step-Down Allocations Parallel Processing of Open Periods, Posting, Translation, Add/Delete Summary Accounts for those using Multiple Sets of Books. 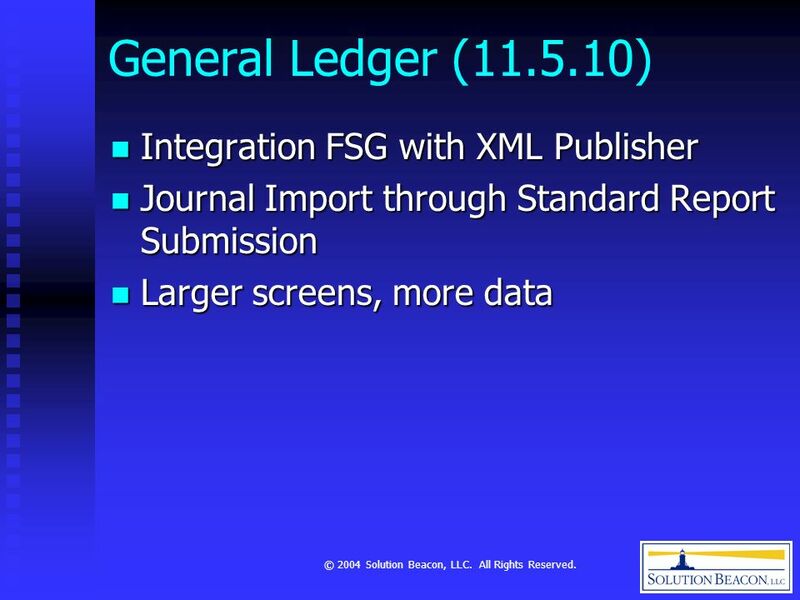 Parallel Processing of Open Periods, Posting, Translation, Add/Delete Summary Accounts for those using Multiple Sets of Books. 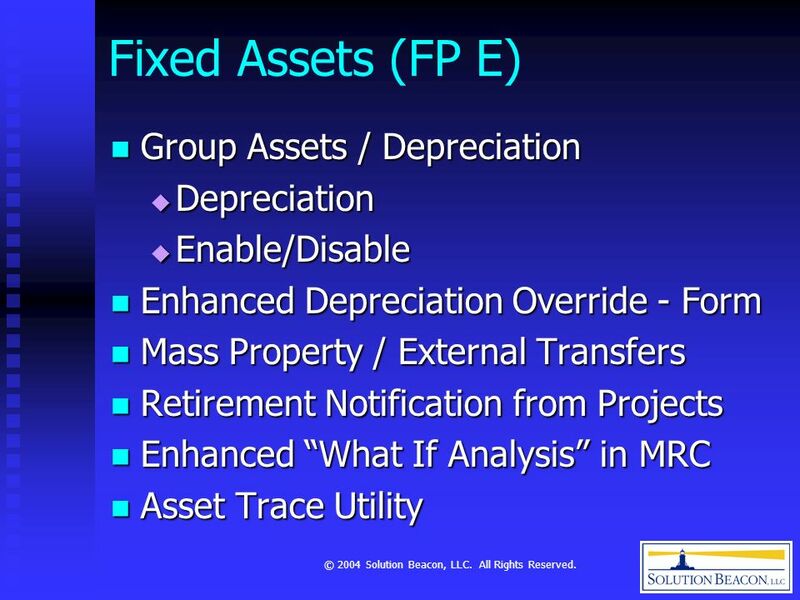 Better Compliance with SFAS #52 and more flexibility when revaluing balances in MRC Reporting Sets of Books. 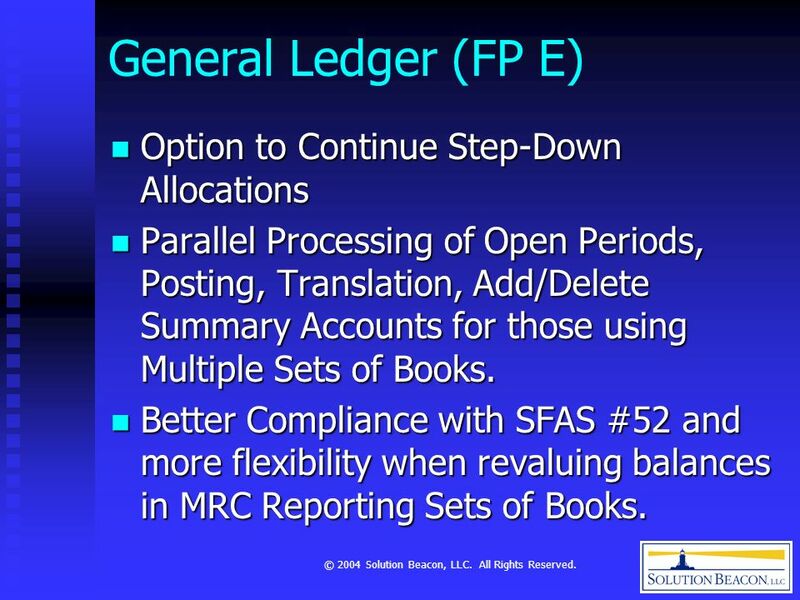 Better Compliance with SFAS #52 and more flexibility when revaluing balances in MRC Reporting Sets of Books. 28 © 2004 Solution Beacon, LLC. All Rights Reserved. 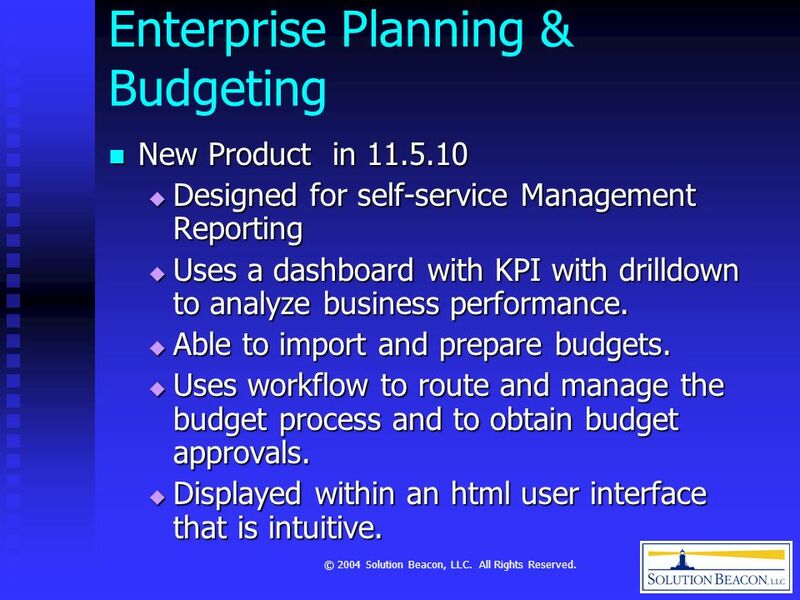 Enterprise Planning & Budgeting New Product in 11.5.10 New Product in 11.5.10 Designed for self-service Management Reporting Designed for self-service Management Reporting Uses a dashboard with KPI with drilldown to analyze business performance. 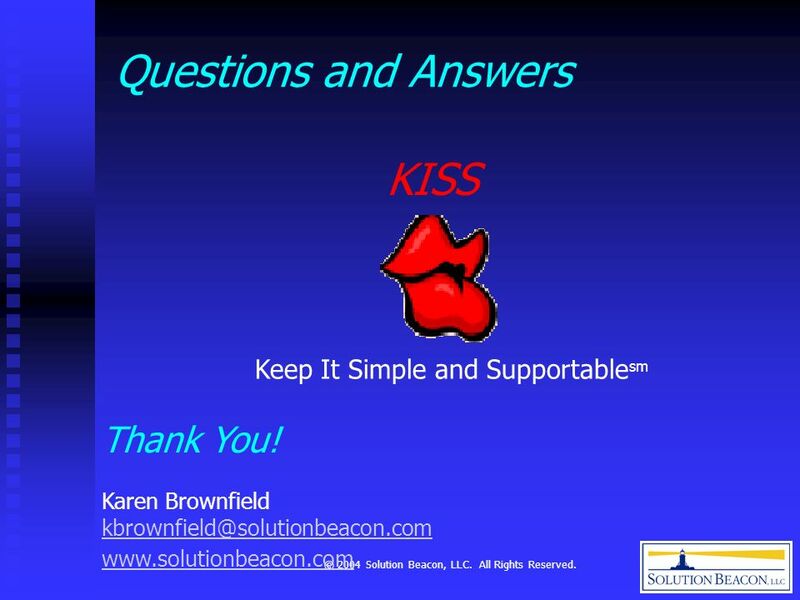 Uses a dashboard with KPI with drilldown to analyze business performance. 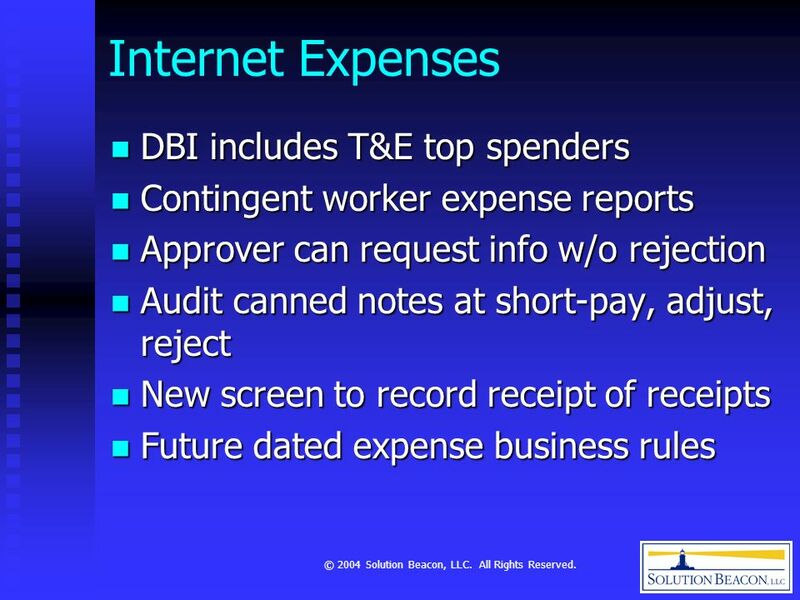 Able to import and prepare budgets. 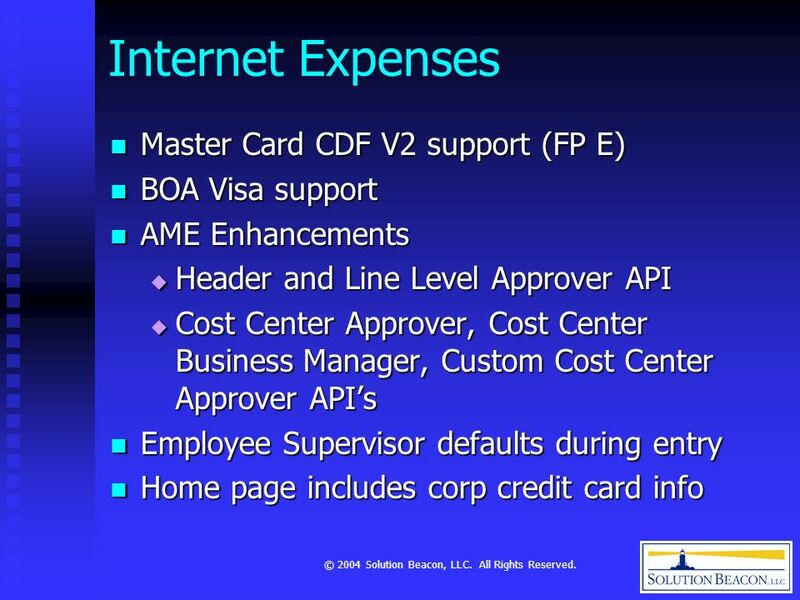 Able to import and prepare budgets. 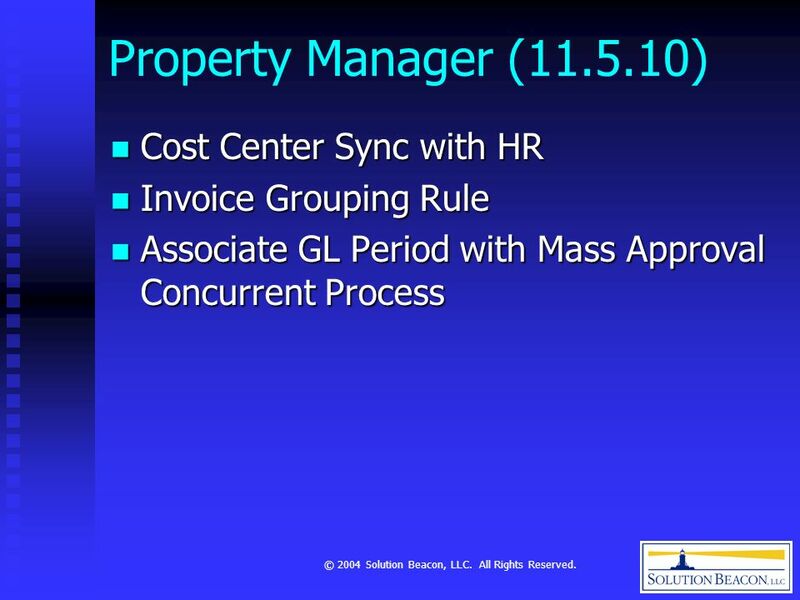 Uses workflow to route and manage the budget process and to obtain budget approvals. 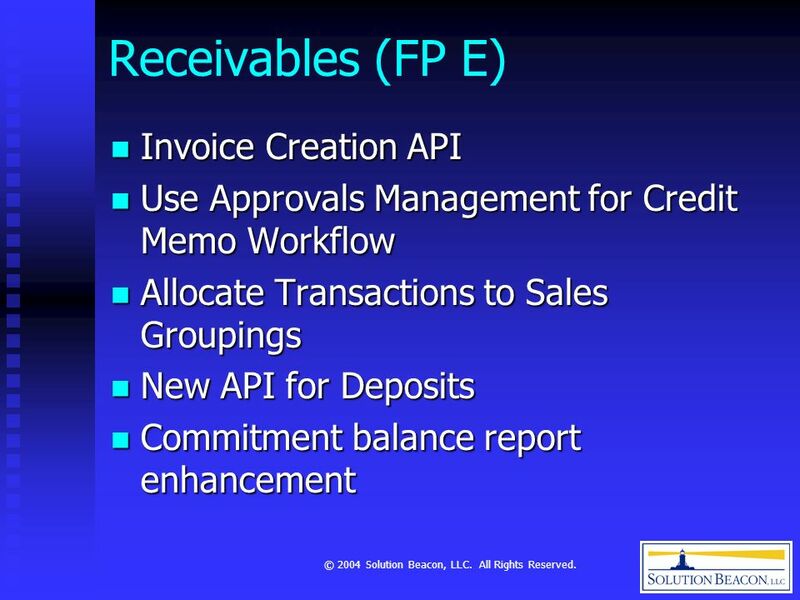 Uses workflow to route and manage the budget process and to obtain budget approvals. Displayed within an html user interface that is intuitive. Displayed within an html user interface that is intuitive. 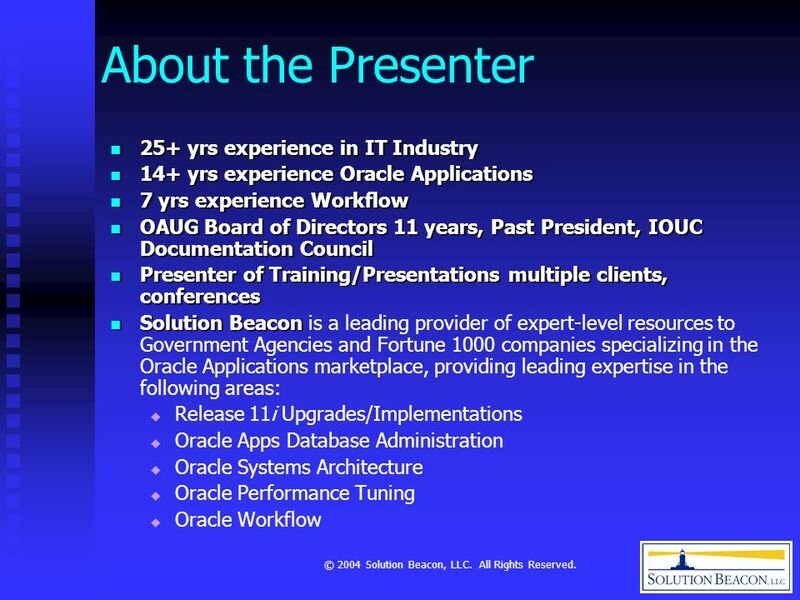 Download ppt "© 2004 Solution Beacon, LLC. All Rights Reserved. 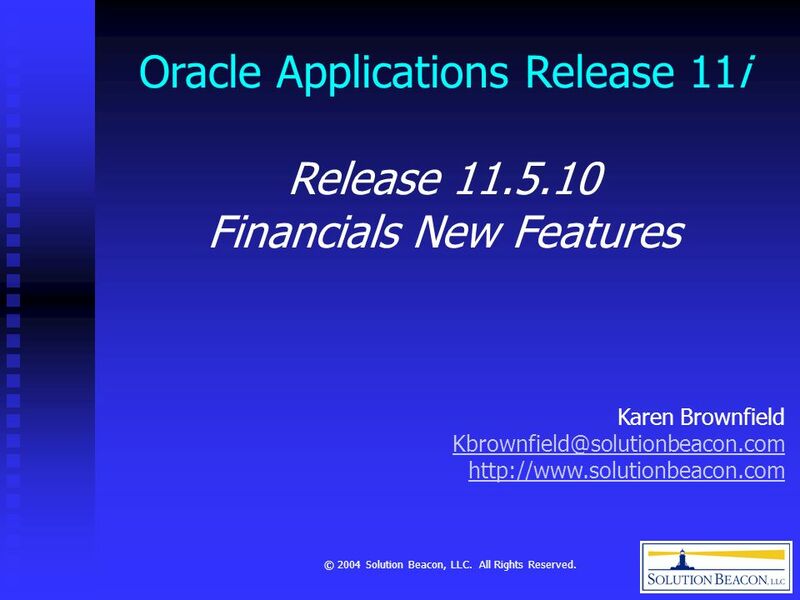 Oracle Applications Release 11i Release 11.5.10 Financials New Features Karen Brownfield"
Keys to building effective Property Management solutions in 11i Richard Byrom Oracle Applications Consultant UKOUG Financials SIG – 14 th September 2004. R12 Assets A Look Inside SM. Copyright © 2008 Chi-Star Technology SM -2- High-Level Overview R12 Setups –Subledger Accounting –ADI Templates –XML Reports. 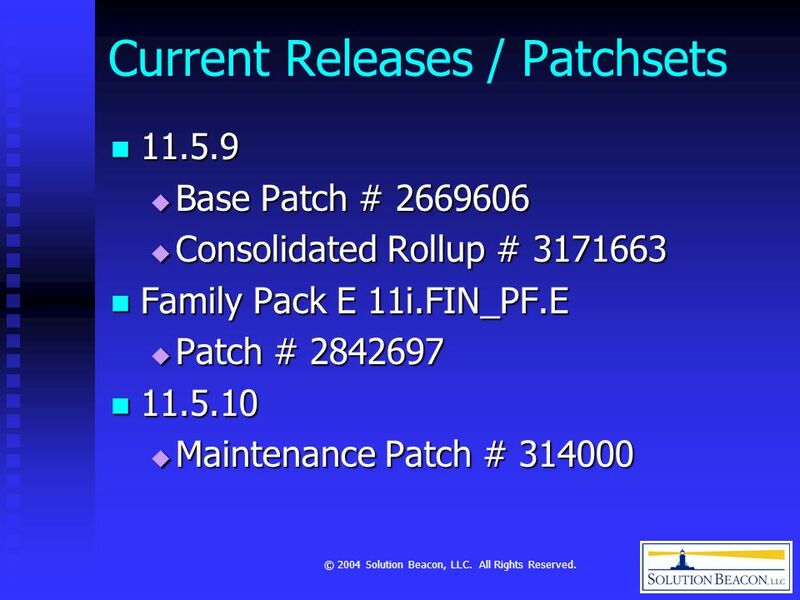 What’s New from Release to GP2013 R2. 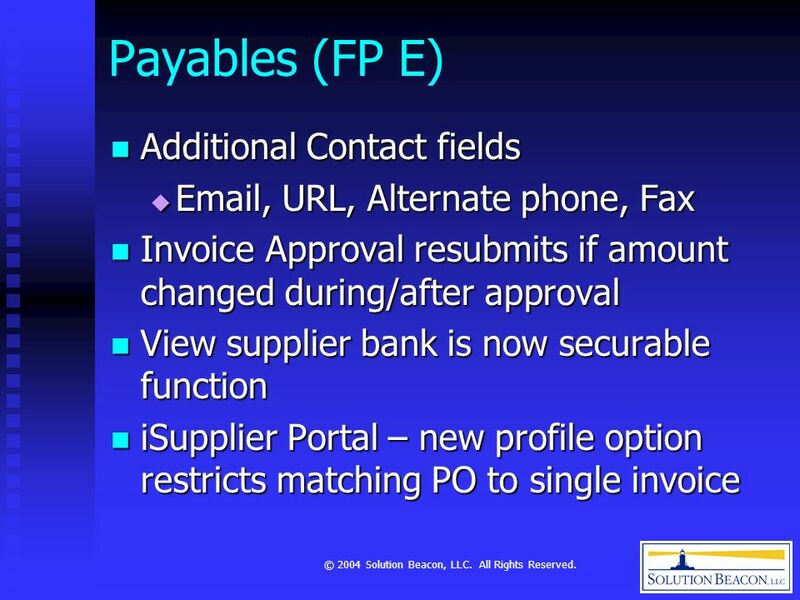 Web client and architecture Microsoft Dynamics GP 2013 SP1/SP2 features Q and A. 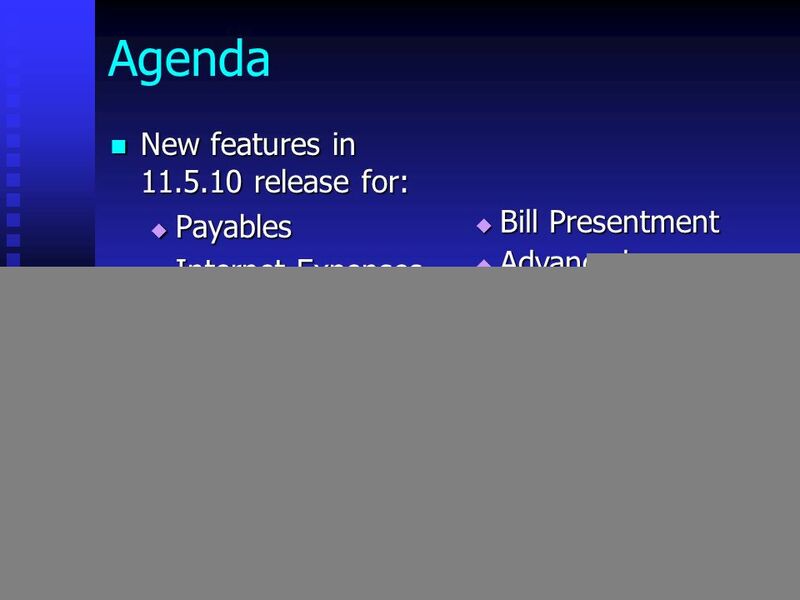 Agenda Database multi-tenancy Home page changes Select printer at time of print in report destination Microsoft ® Excel ® export using open. The most comprehensive Oracle applications & technology content under one roof Procure to Pay Automation Bevan Wright Fusion5 NZ Oracle User Group. 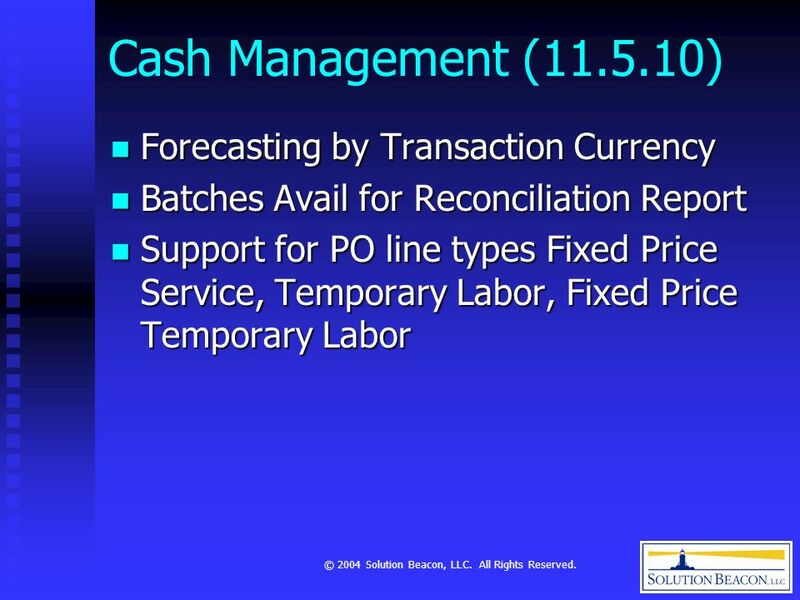 PeopleSoft Financials Maintenance Pack-12 Cumulative Feature Overview. 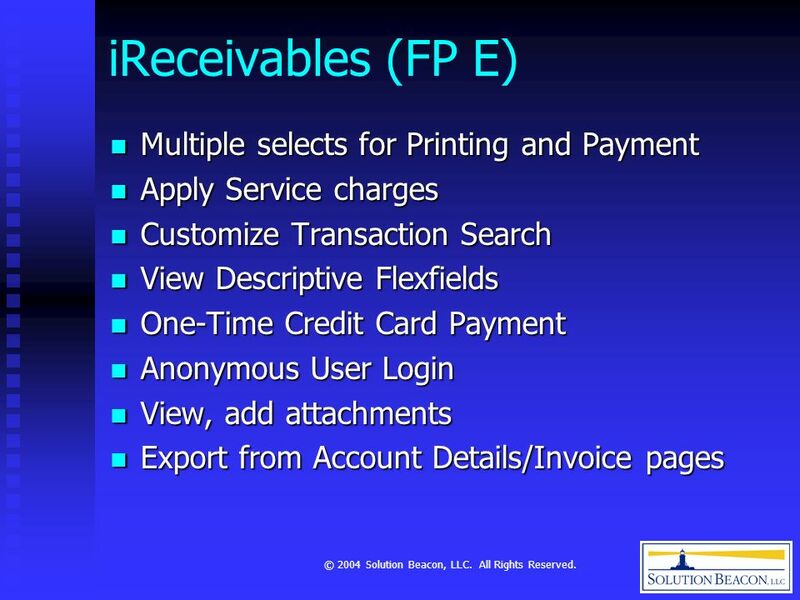 ZETA ERP FINANCE MODULE. 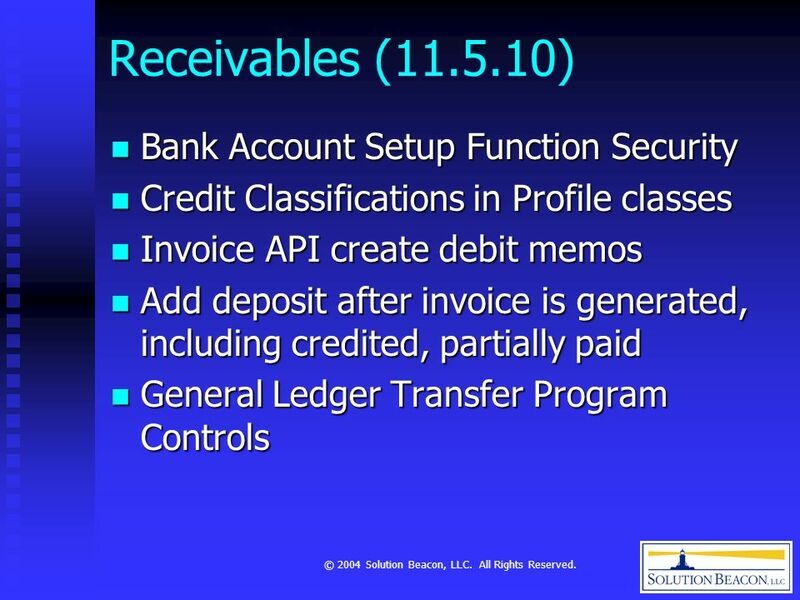 Finance General Ledger Accounts receivable Accounts Payable Bank FINANCE MODULE. 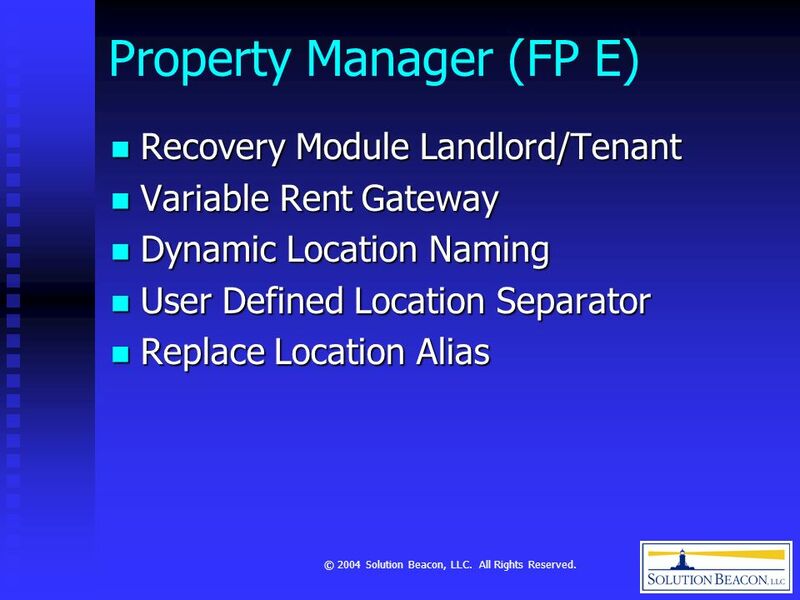 The Best of 2013 Top Features in V12.3 Presenter – Karoline Lapko Account Manager 1.